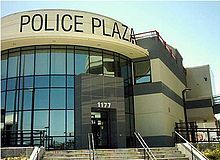 A police station is a building where police officers work. Other members of the law enforcement may work there as well. These buildings often contain offices and accommodation for staff. They also house equipment used by the police force, such as vehicles and weapons. A small police station may have nothing apart from office space. Some police stations have cells for holding people who have been arrested. They may also have special rooms for interviewing people and rooms for storing evidence. This page was last changed on 11 June 2018, at 13:17.